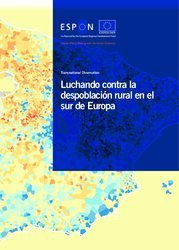 The issue of rural depopulation is particularly challenging in Spain, where the population from rural regions moved massively towards cities and coastal areas between 1950 and 1980 due to the mechanisation of agriculture. 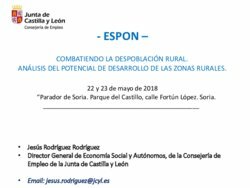 The choice of Soria for the realisation of the ESPON workshop on rural depopulation on the 22nd and 23rd May 2018 was therefore particularly pertinent because it is one of the Spanish provinces that has suffered most from rural depopulation. These migration flows coupled with low birth rates in Spain have led to the depopulation of many rural areas in several Spanish regions. This phenomenon has accelerated territorial imbalances and highlights the importance of counteracting policies and actions, since its associated challenges – poor access to public services (SGIs), low accessibility, lack of economic competitiveness and precarious governance – are interdependent and may trigger a vicious circle, being both the causes and symptoms of demographic decline. Practical measures are needed to encourage more immigration to rural areas and to restore its attractiveness and retain talent. This involves supporting entrepreneurial activities and social entrepreneurship. ESPON studies point to the need for smart place-based approaches and innovative ways to improve the provision of services to tackle both demographic and economic decline. Investment in Information and communication technology (ICT), strengthen the cooperation and collaboration between municipalities (knowledge transfer) and focus on smart specialisation strategies to capitalise on their unique resources (local solutions) are some of the measures needed to enhance attractiveness of rural regions and increase the efficiency of investments. A focus on citizens’ involvement (soft governance) can also partially compensate for a lack of public resources. In parallel, strengthening strategic spatial planning and territorial governance through integrated strategies are needed, since the challenges of rural depopulation require multi-scalar, holistic and long-term strategies. More attention is also needed in emphasising the positive characteristics of rural regions such as the (usually) lower costs for start-ups development (e.g. rent, land costs), and business opportunities in supplying social needs or in sectors such as tourism, forestry, gastronomy and natural heritage. Case studies presented during the seminar stressed the need to retain a positive vision for the future of rural areas as there are good examples in other countries also facing low levels of population density. In Portugal, the municipality of Fundão is implementing a number of combined actions to boost the local economy by promoting the exports of its agricultural products (e.g. cherries and cheese) through show-cases and local festivals, as a way to provide market opportunities for local producers. The creation of a research and knowledge centre on plant biotechnology aimed to transfer knowledge to companies and start-ups and investing in the ‘Internet of Things’ will support pilot projects in various agricultural fields involving companies, producers and local/regional partners and integrate an incubator and a fab lab in the municipality. Training children in skills adapted for local activities is another of the measures being implemented as a long-term investment. 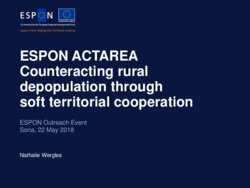 In Romania, and particularly on small and/or remote communities facing demographic challenges, area-based and people-based interventions to fight rural decline effectively are being implemented through Local Action Groups (LAG) as an instrument for (participative) community development. 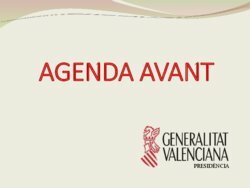 Some Spanish regions are also already developing new models of a territorial approach for social policies through the collaboration between departments and multi-level governance to provide a more integrated approach e.g. Integrated Territorial Investment Plans (ITI). A panel discussion during the Workshop summarised a number of combined actions to improve the situation of rural shrinking regions: a) enhance the emphasis on social innovation; b) improve education and training linked to high-speed broadband; c) increase knowledge transfer; d) promote cooperation and collaboration between municipalities; e) support a new rural narrative towards the exploitation of rural potential and increase the visibility for rural areas; f) encourage positive discrimination and financial incentives to encourage re-population. 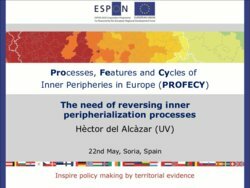 Polycentric Territorial Structures and Territorial Cooperation: What, where and how? For many years, polycentricity has been regarded as a concept of a favourable territorial structure of Europe that should be promoted in order to ensure accessibility of jobs and services to inhabitants in the regions using the accumulated capacity and potential of urban nodes, working jointly, borrowing each other’s strengths and exploring comparative advantages together.